Customer loyalty is a result of reduced friction. All successful enterprises (for profit or non-profit) are in the business of reducing friction that a customer faces in the process of accessing products or services required by the customer. Friction, that arises during pre-product acquisition as well as post product acquisition phases, needs to be reduced to build customer loyalty. Successful enterprises strive to reduce friction during both phases.The expectation is that reduced friction in accessing a product or service will encourage the customer to be more willing to use only that specific enterprise as a source/channel, i.e. customer loyalty. However, friction doesn’t get reduced in one go because it is not just the customer experience but also the customer mindset that is in play behind the decision of a customer to be loyal to an enterprise. From a customer perspective, the willingness to use a particular channel/source follows a four step process as shown in the diagram below and in some ways, each specific sector/industry has evolved over the years following these steps. As an industry matured, successful enterprises within the industry had to take a step upwards to remain in the fray. Those that could not, fizzled out. The first step is continuity i.e. being available “forever”. A customer will not invest time and effort to understand how the channel enables him to access the product or service unless the customer is certain that the channel will continue to be available for a significant period in future. Eg: Continuity is a feature of public sector undertakings and is often a default choice for many people. Predictability is the next level. Predictability is the certainty the enterprise will be able to provide you with the service/product at an expected point of time or as per an expected schedule. Predictability is also the certainty that the product or service will have a set of basic characteristics that the customer expects. Eg: If you require to pick up a coffee at a local store everyday on the way to office and you realise that it is not certain whether it will stay open, would you depend upon it or look for an alternative before that? Continuity and Predictability together build a sense of Reliability in the customers’ mind. The next step is convenience i.e. being available at a point of time, in a form and at a place that meets the customers’ requirement to the best possible extent. An enterprise can meet all three requirements or aim to achieve at least one of the above to be considered a convenient channel. Eg: Bigbasket.com gets you groceries at your place, at an expected time slot and the products are generally fresh! Many who have started using it, often don’t give up. Beyond convenience is the flexibility offered by an enterprise. Flexibility in terms of product/ service options that meet specific needs of each individual customer and/or the ability to modify the choice during the process. Eg: Flipkart lets you return without any questions asked! Convenience and flexibility are bring about a sense of Ease of Access in the mind of the customer which builds stickiness or customer loyalty. 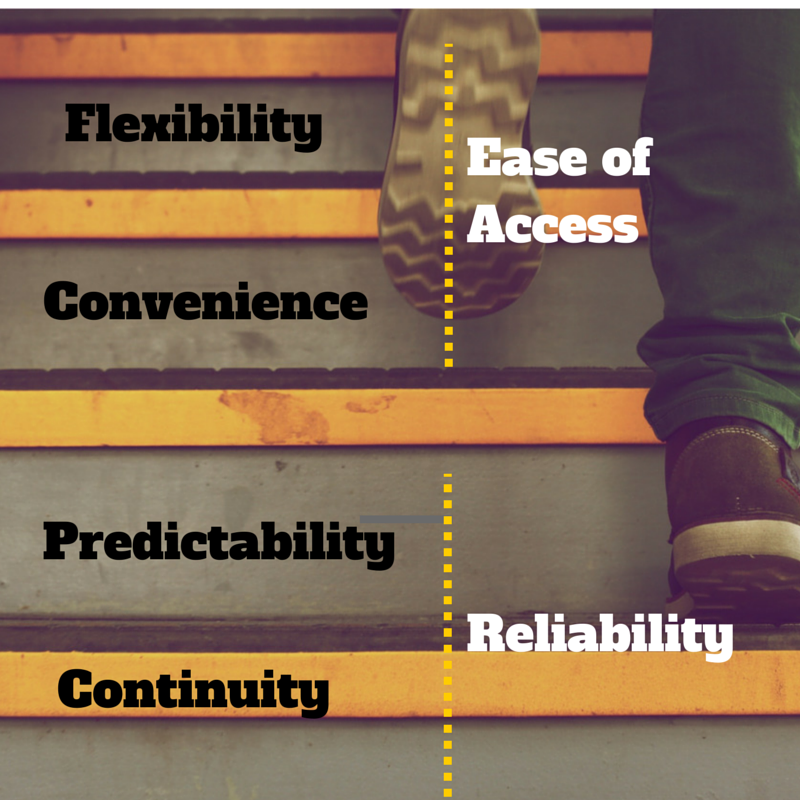 Reliability and Ease of Access need different approaches. Interesting thing about the aspects of Reliability and the Aspect of Ease of Access is that the ability to rely varies widely with the mindset of the customer (within the same customer profile) but the ability to perceive ease of access is quite democratic within a similar customer profile. All new enterprises need to identify a set of early adopters who have the mindset to rely upon the enterprise more easily than the majority population. If the early adopters are satisfied, the word of mouth will enable the late adopters to start believing in the enterprise ability and move over. While it is difficult for the late adopters to easily rely, once a late adopter joins, it is not very difficult for the late adopter to see the value of Ease of Access. In fact, ease of access is something that is often the most visible aspect and often a part of the sales pitch of the enterprise. Reality is, the customer needs to cover the first two steps before they can get the benefit of ease of access and the first two steps is more about the customers’ mindset that what the product offers. So, while it takes a lot of effort to build a perception of reliability, a perception around ease of access is built easily. Similarly, it is easier to change perception with regards to ease of access than with regards to reliability. It must be noted that Reliability is fundamental to the success of the enterprise. An enterprise can fight it out if it is reliable but doesn’t offer ease of access. However, it is impossible for an enterprise to survive if it offers ease of access but doesn’t offer reliability. How does an enterprise provide Reliable and Easy to Access products/services? As an industry matures and more enterprises join the fray, management of the issues that help in building the first two steps get fairly commoditised i.e. earlier, services/products that met the basic first two steps used to have economic value and used to be distinguishable but with more competition, they end up losing differentiation and hence lose the ability to build customer loyalty. The result is that in addition to Reliability, Ease of access becomes critical to the ability of the enterprise to command margins and survive in a mature (competitive) market. Co-ordination (between different supply chain actors) or innovation (technology or process)enables the enterprise to provide better ease of access. The ability of the enterprise to work on these two aspects while keeping the customer shielded from the brisk activity in the back-end by providing an interface that cancels out all the noise (of co-ordination/innovation) is what reduces friction and builds customer loyalty.